Overview: How did President and Mrs. Carter’s interest in wildlife and the natural world collide with the world of pollinators and butterflies? 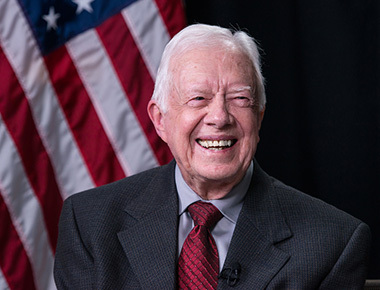 President Carter grew up on a farm near Plains, GA where animals and plants were a central focus. Mrs. Carter grew up in the town of Plains, GA, where in their yard her mother grew traditional Southern flowers like Zinnias and Marigolds – which very likely attracted butterflies. Her father asked her to pull up milkweed growing along the fence that kept in their milk cow. The cow would eat the milkweed and make the milk taste sour because of the bitterness found inside the milkweed plant. Many years later, Mrs. Carter wanted to provide a habitat for butterflies and other pollinators, so she created the Carter Butterfly Trail, which starts with about a dozen gardens all around Plains. The first garden was established at the home of President and Mrs. Carter and features milkweed, which is the host plant of the Monarch butterfly along with a variety of flowering nectar plants. This entry was posted in Grade 1, Grade 10, Grade 11, Grade 12, Grade 2, Grade 3, Grade 4, Grade 5, Grade 6, Grade 7, Grade 8, Grade 9, Grade K, Lesson Plans. Bookmark the permalink.